Organic Patchouli essential oil is one of the most popular essential oils. Dark patchouli is aged in cast iron while light patchouli in stainless steel.. As the essential oil ages, the nascent yellow color morphs into a slightly viscous brown color and develops its characteristic patchouli aroma. Patchouli essential oil is rare in that it is applied in all three world medicinal systems, Chinese, Ayurvedic, and Greek. Organic Patchouli essential oil is wonderful for skin ailments as well as hair deficiencies. By stimulating cellular regeneration patchouli oil reduces inflammation and increases healthy looking skin. It is also reputed to be an aphrodisiac. Organic Patchouli essential oil is a aroamtic addition to cosmetic applications, personal care formulations, soaps, perfumery, incense, candles, and aromatherapy. 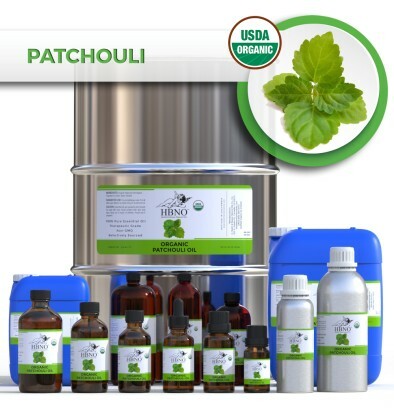 HBNO is pleased to offer USDA organic patchouli essential oil in small packing to bulk and wholesale quantities. We can supply any amount of oil to anywhere in the world.